We had a blast at the Engineering Students’ Society Carnival (also known as Eng Carnival)! There was immense interest shown in EcoCar and we really hope to see our ranks increase this year. Thank you to all the wonderful people who came out to have fun and learn about EcoCar and the other engineering groups. A very special thank you as well to the Engineering Students’ Society for organizing this event and making it possible. It has been really, really nice in Edmonton. But then there are us. I was once again powerless. I pulled over to the side of the track and put my hazards on (yes, we have those). In a flash, the safety crew surrounded me and hoisted me to the towing vehicle. Once the track was clear, I was given a tour of the track behind a safety car. It was not my proudest moment, but rather one of deep reflection. What prevented our success? What had led to all of our problems? Were they avoidable? What should we do differently next time? It was an early morning for our team as members made a supply trip to Home Depot. By what was “7 PM” (noon in normal people time), our axle was fixed and we were ready for round 2 of inspection. We had a few minor problems, but as the saying goes, “third time’s the charm.” In round 3, we welcomed the addition of safety stickers to our growing collection and were finally ready for the track. Today was the day of our technical inspection – the critical step that gives us our safety verification and allows us onto the track. Incidentally, high winds caused a track closure that lasted all day, but this didn’t bother us. For hydrogen teams, tech inspection often ends up being the main event, largely due to the rigorous leak testing we go through. We came here to eat pizza and to set records, and we’re all out of pizza. 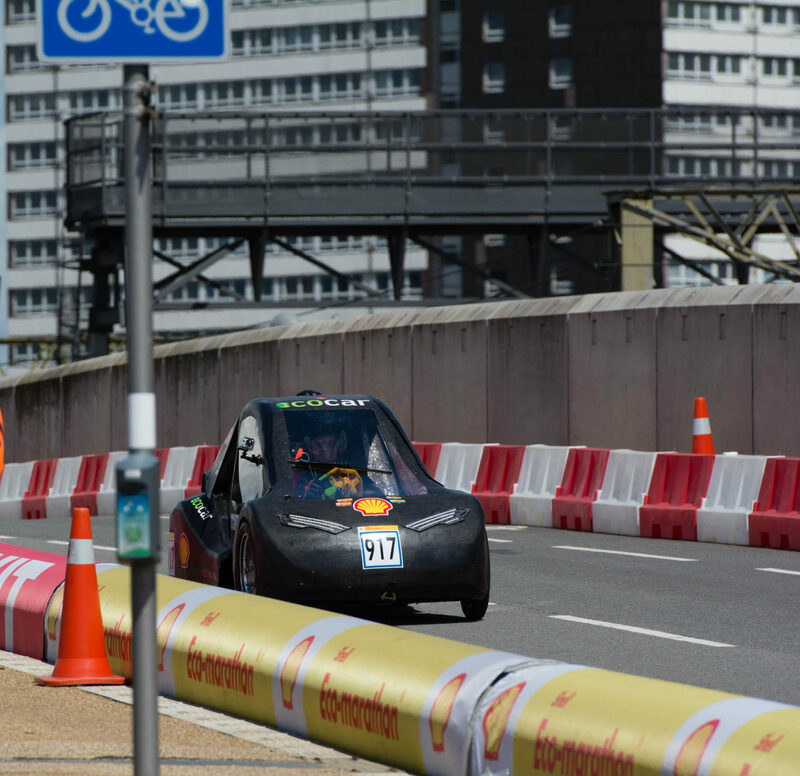 The 2014-2015 EcoCar Team has finally made it to Shell Ecomarathon Americas 2015. You can follow our progress with the beta SEMA tracking app. A routine flight to Minneapolis treated us with a great view of one of America’s Greenest Cities and its numerous bike lanes, but with worrying weather working its way north in the American Mid-West, we were anxious to make it to Detroit before any tornado warnings would delay our flight. Oddly, a mechanical issue with out McDonnell-Douglas MD-90 ended up delaying our flight by three hours, which was followed by snowfall and logistical problems at the Minneapolis airport. After more than four hours waiting on the plane (and doing laps around the de-icing lots), we finally left the Twin Cities for Motor City. Here at the EcoCar blog, we have the opportunity all the time to tell what the team as a whole is up to, but we never really get the chance to sit down and focus on the human side of the team. With the EcoCar world being hectic as ever, I wanted to try something different and focus on a single team member who has been committed to the team for as long as any other.